Finch is the common name for small to medium-sized, seed-eating birds comprising the passerine family Fringillidae, characterized by a short neck, compact body, and short, stout, conical bills adapted for cracking open seeds. Among birds classified as finches are canaries, goldfinches, cardinals, grosbeaks, and crossbills. Finches are found in the Americas, Europe, Asia, and Africa, but are absent from Australasia, Madagascar, Antarctica, and many Pacific Islands (Grzimek et al. 2004). There are many birds in other families that are often called finches. These include many species in the very similar-looking Estrildids or waxbill family, which occur in the Old World tropics and Australia. Several groups of the Emberizidae family (buntings and American sparrows) are also named as finches, including the Darwin's finches of the Galapagos islands. Finches provide various values to humans. Some, most notably the canary, are popular cage birds, kept as pets and prized for their beauty, behavior, and song. As seed-eaters, some are valued for weed control while a few species may provide some help in the control insect populations. Ecologically, they are part of food chains, being consumed by owls among other predators, and some species may help with seed dispersal. Finches are passerine birds; that is, members of the order Passeriformes, the largest order of birds, containing more than half of all bird species. Passerines or passeriforms are also known as perching birds or, less accurately, as songbirds (which actually compose a suborder of Passeriformes). The foot of a passerine is specialized for holding onto a branch, with three toes directed forward without any webbing or joining, and one toe directed backward. The hind toe joins the leg at the same level as the front toes. In other orders of birds, the toe arrangement is different. Passerines generally have sharp, curved claws. The Passeriformes order typically is divided into two suborders: Tyranni (suboscines), and Passeri (oscines). Finches are members of the Passeri suborder. A bird that belongs to the Passeri suborder can be called a songbird or oscine. These include about four thousand species. In the oscines, the vocal organ is developed in such a way as to produce various sound notes, commonly known as a bird song. Oscines have the most control of their syrinx muscles among birds, producing a wide range of songs and other vocalizations. In addition to finches, song birds include lyrebirds, blackbirds, jays, larks, sparrows, warblers, wrens, starlings, and cowbirds. "True finches," members of the family Fringillidae, are small to moderately large birds. They range in size from the Andean siskin (Carduelis spinescens), at 9.5 centimeters (3.8 inches) and 8.4 grams, to the collared grosbeak (Mycerobas affinis), at nearly 23 centimeters (nine inches) and 79 grams (2.8 oz). All true finches have 12 tail feathers and nine primaries. (Yuri and Mindell, 2002, note that Fringillidae are often called “New World nine-primaried oscines,” but that their studies show this family does not in fact have a New World origin.) The outer primaries on their wings tend to be small and are entirely concealed by the coverts (Grzimek et al. 2004). Plumage varies widely, including brown, yellow, orange, red, and gray, and most species are dimorphic, with males exhibiting more bright colors (Grzimek et al. 2004). True finches have strong, stubby beaks, which in some species can be quite large. While the shape and structure of the beak can vary greatly among the Fringillidae, all are conical-shaped, short, stout, and pointed (Grzimek et al. 2004). While the beak can be large in such species as the evening grosbeak (Coccothraustes vespertinus), which use it to open relatively large seeds, some species have a smaller beak, such as the red crossbill (Loxia curvirostra), which uses it to remove seeds from conifer cones (Grzimek et al. 2004). True finches are strong fliers and have a bouncing flight, alternating bouts of flapping with gliding on closed wings. Some are migratory while others remain year-round even in colder areas. Most sing well. Their nests are basket-shaped and built in trees. Finches mostly eat seeds, grains, and other vegetable matter, but may supplement it with an insectivore diet of insects and small invertebrates; chaffinches are particularly insectivorous when feeding their young (Grzimek et al. 2004). The true finches, comprising the family Fringillidae, consist of about 20 genera and 137 species (Grzimek et al. 2004), but the systematics remain contentious, including what taxa to include as part of the family. In general, the family is divided into two subfamilies, Fringillinae (consisting of three species of chaffinches), and Carduelinae (consisting of numerous species, including bullfinches, canaries, crossbills, goldfinches, grosbeaks, serins, and siskins). Some taxonomists include within Fringillidae birds that others place in other families, including such as the tanagers (family Thraupidae), American sparrows and buntings (Emberizidae), and Galapagos finches (Geospizinae), and Hawaiian honeycreepers (Drepanididae) (Grzimek et al. 2004). Some include the Hawaiian honeycreepers as another subfamily (Drepanidinae) and/or unite the cardueline and fringilline finches as tribes (Carduelini and Fringillini) in one subfamily. The buntings and American sparrows were formerly considered another subfamily (Emberizinae). Przewalski's "Rosefinch" (Urocynchramus pylzowi) is now classified as a distinct, monotypic family with no particularly close relatives (Groth 2000). 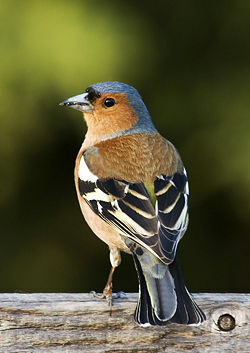 The family scientific name Fringillidae comes from the Latin word "fringilla," meaning chaffinch, a member of this family that is common in Europe. The layout presented here follows the molecular studies of Marten and Johnson (1986) and Arnaiz-Villena et al. (1998, 2001), and takes into account the traditional splitting of the genus Carduelis. The exact position of several genera in the cardueline sequence is tentative. Subfamily Fringillinae - Fringilline finches; contains only three species, which feed their young on insects rather than seeds. Subfamily Carduelinae - Cardueline finches; a much larger group that contains several genera that feed their young on seeds. (Sub)Genus Serinus sensu stricto - European Serin and relatives. (Sub)Genus Crithagra - Afrotropical Canaries, Seedeaters, Citrils etc. (Sub)Genus Carduelis sensu stricto - Linnets, goldfinches, twite and cardueline siskins. Genus Coccothraustes - Hawfinch, Evening Grosbeak - polyphyletic? (Hawfinch may belong in Fringillinae). Subfamily Euphoniinae - Euphonious finches; endemic to the Neotropics; formerly treated in Thraupidae. Arnaiz-Villena, A., M. Álvarez-Tejado, V. Ruiz-del-Valle, C. García-de-la-Torre, P. Varela, M. J. Recio, S. Ferre, and J. Martínez-Laso. 1998. Phylogeny and rapid Northern and Southern Hemisphere speciation of goldfinches during the Miocene and Pliocene Epochs Cellular and Molecular Life Sciences 54(9): 1031–1041. Retrieved January 6, 2008. Arnaiz-Villena, A., J. Guillén, V. Ruiz-del-Valle, E. Lowy, J. Zamora, P. Varela, D. Stefani, and L. M. Allende. 2001. Phylogeography of crossbills, bullfinches, grosbeaks, and rosefinches Cellular and Molecular Life Sciences 58: 1159–1166. Retrieved January 6, 2008. Clement, P., A. Harris, and J. Davis. 1993. Finches and Sparrows: An Identification Guide. London: Christopher Helm. Groth, J. G. 1994. A mitochondrial cytochrome b phylogeny of cardueline finches. Journal für Ornithologie 135: 31. Groth, J. G. 1998. Molecular phylogeny of the cardueline finches and Hawaiian honeycreepers. Ostrich 69: 401. Groth, J. 2000. Molecular evidence for the systematic position of Urocynchramus pylzowi. Auk 117(3): 787-792. Klicka, J., K. P. Johnson, and S. M. Lanyon. 2000. New World nine-primaried oscine relationships: Constructing a mitochondrial DNA framework. Auk 117: 321-336. Marten, J. A., and N. K. Johnson. 1986. Genetic relationships of North American cardueline finches Condor 88(4): 409-420. Retrieved January 6, 2008. Newton, I. 1973. Finches. New Naturalist series. Taplinger Publishing. ISBN 0800827201. Ryan, P. G., D. Wright, G. Oatley, J. Wakeling, C. Cohen, T. L. Nowell, R. C. K. Bowie, V. Ward, and T. M. Crowe. 2004. Systematics of Serinus canaries and the status of Cape and Yellow-crowned Canaries inferred from mtDNA and morphology. Ostrich 75: 288-294. Treplin, S. 2006. Inference of phylogenetic relationships in passerine birds (Aves: Passeriformes) using new molecular markers Retrieved January 6, 2008. Yuri, T., and D. P. Mindell. 2002. Molecular phylogenetic analysis of Fringillidae, "New World nine-primaried oscines" (Aves: Passeriformes) 'Mol. Phylogen. Evol. 23: 229-243. Retrieved January 6, 2008. This page was last modified on 10 April 2017, at 18:02.